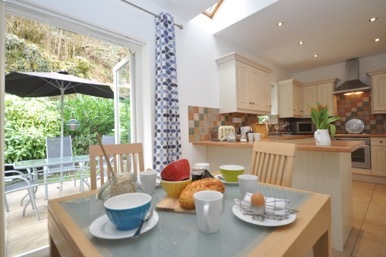 Nestled within the hillside of a small hamlet of cottages and surrounded by woodland with the noise of a babbling brook, this holiday property is just a short walk into Tintern on the banks of the River Wye. Tintern is steeped in history and home to a magnificent 12th century Abbey that dominates the landscape. The village is well served with hotel, two village inns, a cafe/village store where you can wander down to collect your bread and paper for the day ahead. A great base for exploring, with easy access further into the Wye Valley and Forest of Dean, catering for all tastes with stunning woodland, cycle paths, mountain biking, Go Ape and Puzzlewood. For walking there is the Angiddy Trail which starts just outside the house and the Wye Valley Walk and Offa’s Dyke pathway. If you have time, there are many market towns to visit including Chepstow, Monmouth and Ross-on-Wye. Take in the peace with just the noise of a babbling brook before you step inside the hallway. At the head of the hallway you will find the kitchen/diner, a light and airy space that’s just perfect for friends to catch up. The kitchen is well-equipped with an electric oven and hob, microwave, fridge/freezer and washing machine, the breakfast bar divides the space well with room for a dining table and chairs that offers views onto the rear patio through the French doors. The lounge situated off the hallway, offers a cosy area great for an evening in watching TV, or a film on the DVD. There are three bedrooms leading off the hallway, a double with views across the front gardens and woodland, a twin which also enjoys views across the woodland, and a further twin room. Completing the accommodation is the bathroom with separate shower and WC and a further separate WC. Open the French doors onto the rear patio where you can enjoy a morning coffee with bird song. To the front of the property you can watch the world go by on one of the wooden benches. There is off-road parking for two cars. Films are shown in the Village Hall on the second Friday of every month and there are other events which are advertised on the notice board outside the hall. 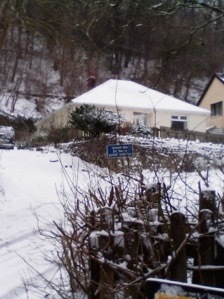 The Village Hall is within walking distance of the house. For more details about what is going on in Tintern, please go to the Events page on this website. Sorry, but we don’t take dogs and there is currently no wi-fi although wi-fi is available in the local pubs/cafés. 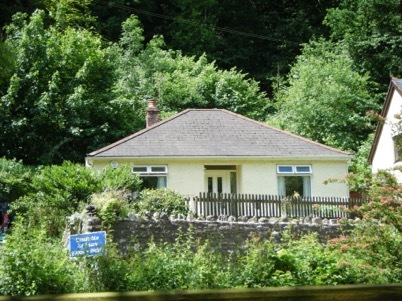 For further information and photos of Underwood Bungalow, please look at the Holiday Cottages website and enter Tintern, Wye Valley or Tintern, South Wales in the search box.